How many kilometres have Barça travelled in 2017? 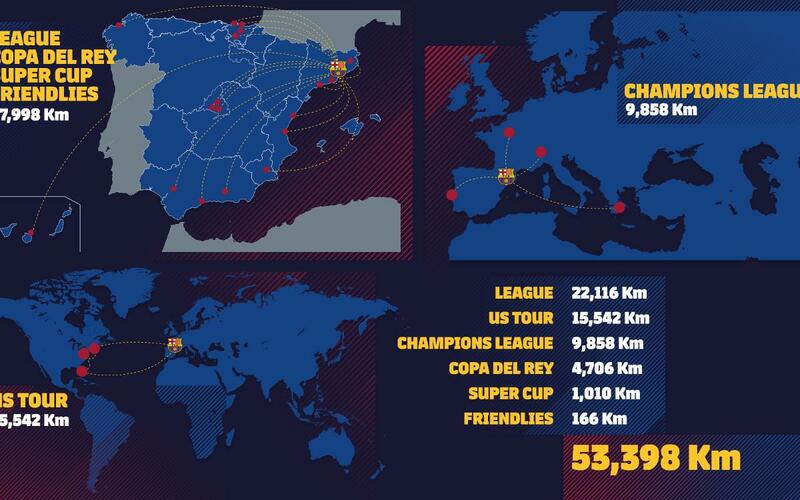 FC Barcelona have done no less than 53,398 kilometres on the road this calendar year spread over 36 trips. Starting back on 5 January with an away game in the last 16 of the Copa del Rey in Bilbao and ending with the victorious trip to the Santiago Bernabéu to take on Real Madrid which saw Ernesto Valverde’s men take a 3-0 win that left them nine points clear of their nearest rivals in the league at the turn of the year, the squad have travelled around the world to great success. 20 of these trips have come in the league, five in the Copa del Rey, five in the Champions League, one in the Spanish Super Cup and three on the US pre-season tour with another also coming in pre-season. With Luis Enrique as coach, the blaugranes made 17 away trips before embarking on another 18 since the arrival of Ernesto Valverde as coach. Countries to have seen Barça play away from home are France, Italy, USA, Greece and Portugal. Amongst the trips made by the blaugranes, six trips to Madrid spring to mind that add up to total of 6,060 kilometres. Barça have made two trips to Turin, Italy and two also to Bilbao, Villarreal and Vitoria. April was the busiest month in terms of travel with five away trips whereas the previous month of March saw just the one trip to take on Deportivo in La Coruña. June was the only month in which the blaugranes did not make a single away trip. It goes without saying that the tour of the USA was the longest trip to Barça in 2017. The visits to New Jersey, Washington DC and Miami accounted for 15,542 kilometres, some 34.3% of the total. In short, a demanding year for the blaugranes, one that began with a win away from home and ended with another for the record books.